Out of the winter mist crossing Knippels Bridge last week, cranes appeared. Work has begun on one of the many new bicycle bridges over Copenhagen harbour. This one is a main link across the harbour and will connect with three others to cut travel times for bicycle users and pedestrians across the harbour. Two other bridges are planned elsewhere along the harbour as well. 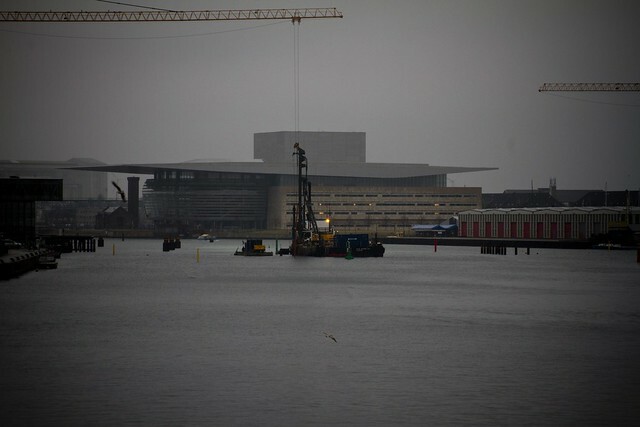 Here's an article about the bridge rising from the sea in the above shot: New Bicycle Bridges Over Copenhagen Harbour.